After the badly dilapidated Dachau Castle was converted into a summer palace by Duke Albrecht V in 1558, a Renaissance garden designed in geometrical order with walls and square flower and herb beds, was created from 1578, based on plans by the painter architect Friedrich Sustris. It was the Elector Max Emanuel who proceeded to give the Palace Gardens of Dachau a baroque image in 1715. The Elector’s architect and master builder, Joseph Effner, replaced the flower and herb beds with two large broderie beds decorated with topiary box trees and flower borders. At the same time, the Elector ordered the purchase of a small forest area to the west of the gardens, which he and his successors filled with all sorts of playing equipment, including a skittle alley, a swing, various wooden huts and more. The gardens were simplified at the start of the 19th century. 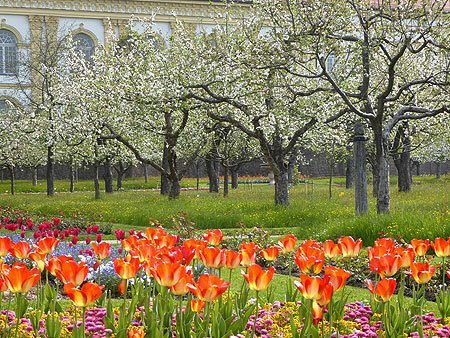 The general manager and artistic director of court gardens, Friedrich Ludwig von Sckell had fruit trees planted within the garden walls from 1802. The playing garden in the copse gradually disappeared. From the garden's attractive ridge location there is a panoramic view extending to the Alps. A bee garden has been laid out in the Court Garden so that garden visitors can find out all about these useful insects. 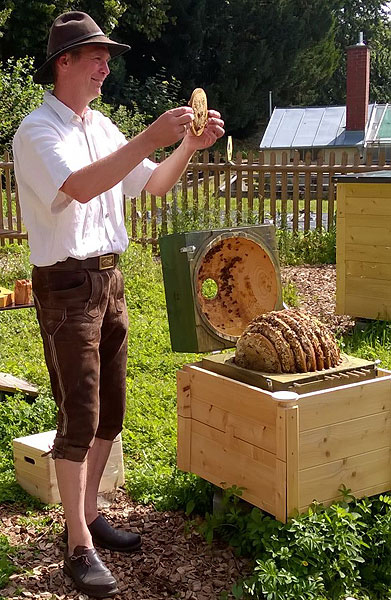 Information panels explain what is special about this bee garden: in addition to conventional hives it has innovative spherical hives developed by Andreas Heidinger where the activities of the bees can be observed. Andreas Heidinger, together with beekeeper Sabine Huber, initiator of the project, looks after the five bee colonies. The panoramas or pictures to be loaded are rather large, and thus take a relatively long time to load. Please be patient – they are worth waiting for! The tour opens in a separate window and was prepared by Josef Spitzlberger, Oberschleißheim.